[by Woorim Ahn] EXO is conquering the world with its third official album ‘EX’ACT’. According to the group’s agency SM Entertainment on June 23, the group’s new album ‘EX’ACT’ was ranked on the first place of United World Chart running by Media Traffic. The album also topped on Japanese Tower Record and Taiwanese FIVE MUSIC chart. 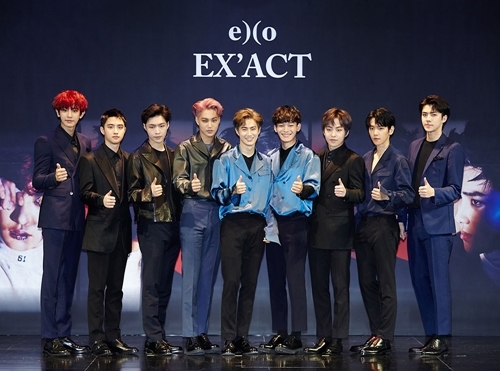 Moreover, EXO swept Korean major charts such as Hanteo Chart, Sinnara Record, YES24, Aladine, HOT Tracks and others for two weeks in a row as well as on Gaon Chart to prove the group’s matchless popularity and power. The music video of title song ‘Monster’ reached 20 million views after 10 days of its release and the video ranked first on YouTube’s ‘K-Pop Music Video Chart TOP20’.